How Should We Respond to the Horrific Church Shooting in Texas? The First Baptist Church of Sutherland Springs, Texas. …Preach the word; be ready in season and out of season; reprove, rebuke, and exhort, with complete patience and teaching (2 Timothy 4:2). Today, a mad gunman burst into the First Baptist Church of Sutherland Springs, Texas, and killed (at least) 26 people and shot approximately 20 more. Average attendance for the church is in the fifties, meaning that almost everyone was shot. The youngest victim was reportedly two and the oldest is in their 70s. The pastor’s 14-year-old daughter was murdered. The gunman was Devin Kelley, a 26 year-old with a dishonorable discharge from the military. Reportedly, he was a registered Democrat, former VBS instructor, and by some reporting, involved with Antifa (no one knows at this point how valid the reporting has been in its earliest of stages). Also, Kelley had posted a photograph of his AR-15 rifle on Facebook in late October. It is unknown what his connection is with the church, but it is not believed he had one. One Citizen grabbed his rifle when seeing the shooting, and took up pursuit with another Citizen who stopped and let him in his vehicle. They pursued Kelley until he ran off the road, and they kept point until police arrived. It is unclear if Kelley was shot by the Citizen or by his own hand. We know that this little town near San Antonio is reeling in agony. For them, this tragedy is Apocalyptic in scale. An entire church was wiped off the face of the Earth, entire families were decimated, an entire community for the rest of time will be remembered as the place where it happened. No doubt, this little hamlet of civilization has been flooded with news agencies from around the world, agents with the FBI and ATF, ambulance-chasing opportunists of the worst varieties, and well-meaning helping hands (who often get in the way). Whenever schools resume, they will need an army of people trained in crisis therapy. Life will not get back to “normal” in this town for a long, long time – if ever. Likewise, we can expect for liberals to call for gun control (in fact, they already have started) and conspiracy theorists will find reasons to explain that this is a “false flag” designed to confiscate firearms. If Kelley is indeed an activist with Antifa or a registered Democrat, conservatives will claim this is the fruit of an increasingly anti-Christian culture. If Kelley was on psychotropic prescription drugs, it will be used as further evidence that we are medicating people into sociopaths. Anti-military activists will claim that the army is creating killers. If Kelley was a conservative, liberals will seek to draw him to some kind of militia movement and perpetuate the stereotype of dangerous white men. All of those conversations will be had in coming days. It will be easy to get sucked into the political volleying back and forth between conservatives and Marxist fascists who want to disarm America. It will be easy to make that the substance of our concern. We can expect political opportunists to take as much advantage of this situation as ambulance-chasing lawyers at a horrific crash scene. Clearly, the first thing we must do is pray for the survivors and loved ones of the deceased at the First Baptist Church of Sutherland Springs. Our petitions should be made to the God of mercy without ceasing in coming days (1 Thessalonians 5:17). We mustn’t just drop a short, drive-by prayer – a “God be with them” – a prayerette in passing, but repeatedly throughout the day drop our heads and pray for those who are left behind this tragedy, who must slowly but surely pick up the pieces to their shattered lives and figure out how to move forward with their loved ones buried in the ground. We should pray that the Holy Spirit intercedes with groanings too deep for words (Romans 8:26), because in a time like this, words fail us. Certainly words are failing those in Sutherland Springs this evening. Sometimes there is little to say, and the Holy Spirit intercedes for us when our spiritual brokenness exceeds our mental ability to convey those thoughts into words. We should also give supplications, prayers, intercessions, and thanksgiving to the city, county and state officials who have to clean up the mess (1 Timothy 2:1-4), distribute justice, dispense mercy, and provide law and order in the midst of tragedy. Likewise, we should force our flesh to cry out in prayer for the wicked, which would include the shooter (if he weren’t already gone to his own place) and those capitalizing on the tragedy for their own political agenda, being instructed in Scripture to even pray for our enemies (Luke 6:27-28). 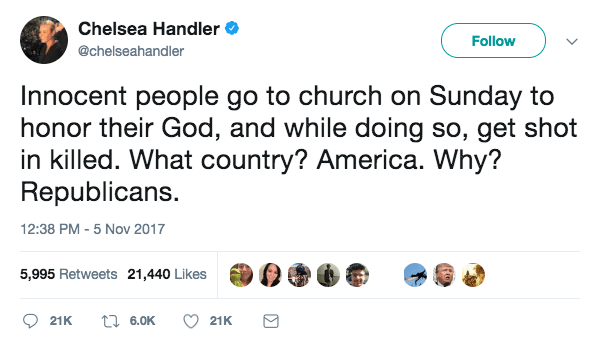 Finally, concerning prayer, we should mourn with those who mourn and enter ourselves into a time of grief and grieve with and alongside Sutherland Springs, Texas. People are especially receptive to the Gospel in times of terrible travesty. We are not Gospel opportunists because this would imply we only share the Gospel when times are bad. In fact, we simply share Gospel in all seasons, which include seasons of suffering. This world is a broken mess and life is short and full of sorrow (Job 14:1). There is no better time to discuss these matters than when examples of their truthfulness are still fresh in our minds. Third, we should take note. While tragedy creates emotionality, emotionality clouds wise judgment. While liberals cry out that it is now time to discuss gun control, we know that policy decisions are best made when people are thinking rationally, and not thinking emotionally. Without being rash, we should nonetheless take note of the lessons here, and make future use of them when we have fully thought out their implications. For example, we should take note that this was a small church, with probably few enemies in the world. This was not a megachurch that might attract throngs of people with perverse political agendas or mental disorders. And yet, a madman decided to approach this small church and wage war against it, ambushing it on a bright Sunday morning. What this means is that any church, at any time, can be attacked, for any reason. Likewise, we should take note that a lot of people were murdered in a very short period of time. Reaction time, for those of us who steward churches, is very limited. We are simply not afforded time in such an active shooter scenario. Our churches must be prepared to protect the flock against imminent threats, guard and lock doors, and fire back at a moment’s notice (for a Biblical defense of self-defense, read this post, “Why Some People Need A Good Killing“). There are fewer ideas with less Biblical warrant and less historic support among orthodox churches than the absurd notion of pacificism, which has largely been relegated to sub-Christian cults. Christians have always been people who fired back in order to protect the innocent, and we must be prepared to do so. We should not be armchair quarterbacks when it comes to church security. We do not know if anyone in the congregation was armed (or if its armed members had a chance to return fire before being sucker-punched with semi-automatic gunfire through the wall). We do not know if that church had a security plan in place. And frankly, you and I (probably) do not know what it is like to use a firearm in a crisis situation, and we do not want to pretend that it is as easy as we’ve made it out to be in the movies. The fact is, a madman with a gun can kill a lot of people before he is stopped, even in a community with lots of Citizens carrying their own self-defense firearms – especially when he attacks without warning. We should also not forget that at the very center of this mess are approximately 50 victims, some of whom are alive and some of whom are dead. People are important, and the people of this community are hurting. Remember that when you are tempted to use the facts surrounding this tragedy to bludgeon the political enemy. That club is covered with blood, so be conscientious about how (or if) you swing it.